Stand Collar Traditional Shirt. diamond. Colour blue white. Classic fabric. Classic check. But completely new styling. 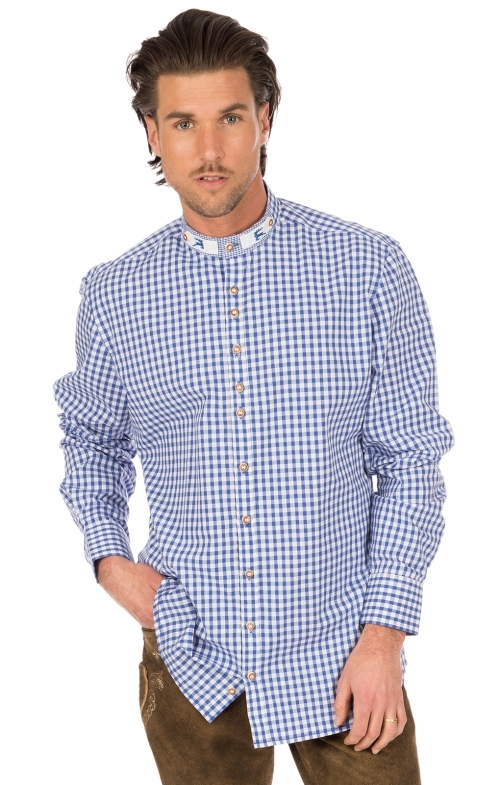 The traditional shirt by Orbis sets new accents. The traditional costume specialist, who is always good for new and unusual ideas, hits the mark with this shirt and especially with the completely new raised collar solution. Very youthful look due to the irregular button gaps within the button row and the raised collar. This is trimmed with a check contrast fabric at the front and worked with a buttoned white embroidered with a deer latch. The collar can be closed as shown here, but also very well open to wear. The raised collar shirt is available in slim fit. Sehr gute Qualität, die Passform eben halt tailliert. Der Stehkragen ist ein Hinkucker. Qualität und preisleistungsverhältnis stimmt! Farben sind auch identisch!